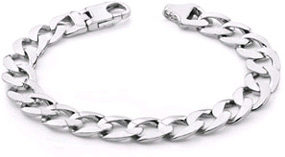 All of our white gold design and white gold link bracelets are higher in quality compared to standard machine-made white gold bracelets, because they are individually hand-made to order. This creates a smoother, cleaner finish and reduces the amount of air bubbles (porosities) inside the white gold for a finer consistency and smoother surface. All of our white gold chains are substantial pieces with weight and depth that is above average. Choose from white gold curb bracelets, white gold figaro bracelets, white gold mariner bracelets, and white gold design bracelets. 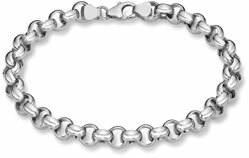 All of our bracelets are guaranteed 14k solid white gold. All bracelets are also available in yellow gold and can be made in any length by request.